A panel discussion at the İstanbul Museum of Modern Art earlier this week turned into a debate on censorship and the state of contemporary art in Turkey after the museum decided not to include an artist’s work in a recent auction. The museum is privately funded by the Eczacıbaşı Group, a prominent Turkish industrial group of companies founded by the Eczacıbaşı family, which provided the initial investment and project management finance as well as the core collection of paintings. Earlier in the month, the museum had removed a work by Bubi Hayon (David Hayon) from its program for an invitation-only auction night titled “Gala Modern,” to which several artists had been invited to donate works of art or objects to in an effort to raise money for the museum’s educational programs. The piece was a wooden chair with a chamber pot for its seat. In response, Hayon issued a press release, arguing that the museum’s decision amounted to censorship. The museum, on the other hand, claimed that it had the right to choose which works of art to include in the event and that Hayon’s contribution had not met the proper criteria. Artists announced on Monday through social networking sites that they had decided to devote the [aforementioned] panel discussion to such issues as transparency and private and public institutions as well as artists’ rights. The panel was initially organized as part of the museum’s ongoing exhibition “Dream and Reality,” a chronicle of the works of female artists from Turkey since the 1900s. But discussion at the event, attended by more than 80 members of the art scene took on a life of its own after panelist Mürüvvet Türkyılmaz announced that she would be withdrawing her work from the show in response to İstanbul Modern’s actions. The audience then raised questions and voiced concerns about an array of problems related to several forms of censorship dominating the current art world in Turkey, a lack of organization among artists and problems caused due to the fact that all major cultural institutions in the country are backed by various corporate entities and the lack of transparency in their activities. The Istanbul-based Today’s Zaman published one of the first English-language articles on this conflict. They go on to explain that Türkyılmaz has been joined by seven other artists – Ceren Öyküt, Gözde İlkin, Güneş Terkol, İnci Furni, Ekin Saçlıoğlu, Neriman Polat, Leyla Gediz and the artist collective, AtılKunst, who have all requested that the museum remove their works from the exhibition in protest. “First Istanbul Modern requested a work, without telling me any concept. They told me that they wanted to exhibit the work during the gala night and then make the work a part of the exclusive catalogue,” Bubi (David Hayon) told the Hürriyet Daily News. Upon this request Hayon created a large seat with a bed pan in the middle of it. However, things did not go as Hayon planned. The museum refused to collect the work and did not exhibit it. “It is not important whether they like it. There is something more important than that,” Hayon said. 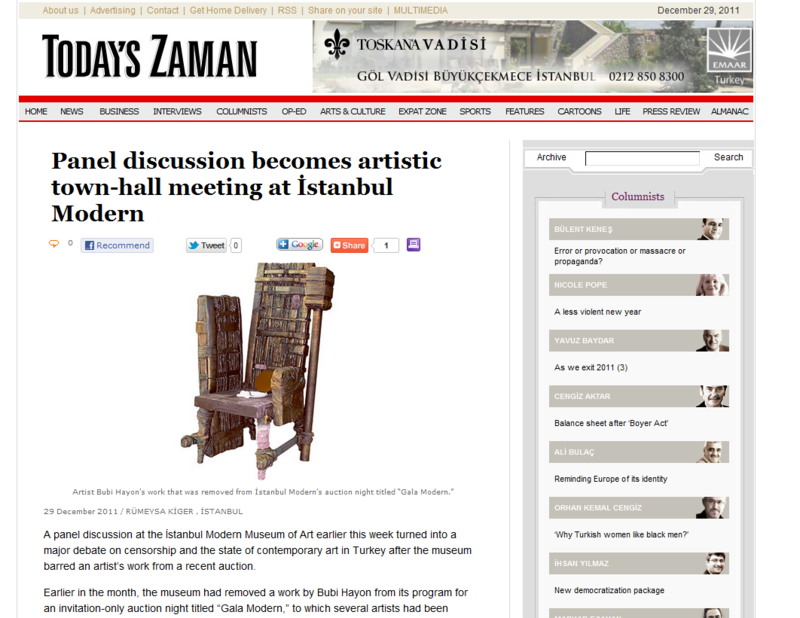 The International Association of Art Critics’s Turkish division and the strangely named Turkish National Committee of the International Plastic Arts Association are supporting Istanbul Modern’s position and they have offered their definition of censorship, which they claim can only be called as such if a third party, such as a government, a local authority, a ministry, a municipality or the police, were involved. This debate comes at a time when Turkey is proving to be a growing presence in the international art scene with a burgeoning gallery scene, growing museum culture and contemporary art auctions that have attracted the attention of secondary market watchers. We consider the whole course starting with the first moment of acceptance of the invitation, the creation of such an artwork, submission and the withdrawal and press release following to the applied fearless censorship, as Bubi Hayon’s “artistical existence, activity, production”, applaud “oturak” which, surely will gain “value” day by day, for underlining an issue with serious lack of awareness in Turkish art society, and declare that until an apology is made, we are not any longer interested in participating to any artistic platform organized by Istanbul Modern, at where may be some other time, the same “Oturak” (stool) is to be exhibited, by the same or a different chief curator and with it’s “submitted context untouched”. More details around this case forthcoming. As of now the Istanbul Museum of Modern Art plans to go ahead with the exhibition Reality and Dream, without the works of the artists that have pulled out in protest. We thank the artists involved and their supporters for drawing our attention to this conflict and we will continue to report on the case. There are claims of censorship in Istanbul as eight artists and an artist collective have made a joint decision to withdraw from the Istanbul Modern museum’s ongoing Reality and Dreamexhibition, which chronicles the works of female artists from Turkey since the 1900s. The controversy began when artist Bubi Hayon’s work was rejected during a charity auction for the Turkish museum then during a panel discussion at the museum earlier this week artist Mürüvvet Türkyılmaz announced that she would be withdrawing her work from the show in response to museum’s actions. The debate has since snowballed into a discussion about the role of contemporary art in Turkey and the problems associated with the fact that all major cultural institutions in the country are backed by corporate entities that lack transparency.The matter has been percolating on Facebook and other social networks all week but numerous attempts by Hyperallergic to reach the artists for comment have so far proven unsuccessful. Today, the Istanbul-based news source Today’s Zaman has published one of the first English-language articles on the controversy. They explain that Türkyılmaz has been joined by seven other artists (Ceren Öyküt, Gözde İlkin, Güneş Terkol, İnci Furni, Ekin Saçlıoğlu, Neriman Polat, Leyla Gediz) and one artist collective, AtılKunst, who have all requested that the museum remove their works from the exhibition. A source close to the artists tells Hyperallergic that the artists are working on a press release now and it will be available shortly. The group has started a Turkish/English petition online and they are asking the museum to apologize to Hayon and the city’s art community as a whole. A panel discussion at the İstanbul Modern Museum of Art earlier this week turned into a major debate on censorship and the state of contemporary art in Turkey after the museum barred an artist’s work from a recent auction. Earlier in the month, the museum had removed a work by Bubi Hayon from its program for an invitation-only auction night titled “Gala Modern,” to which several artists had been invited to donate works of art or objects to in an effort to raise money for the museum’s educational programs. The piece was a wooden chair with a chamber pot for its seat. In response, Hayon issued a press release, arguing that the museum’s decision amounted to censorship. The museum, on the other hand, claimed that it had the right to choose which works of art to include in the event and that Hayon’s contribution had not met the proper criteria. The International Association of Art Critics (AICA) Turkey board of directors, however, issued a press release last week stating that the decision of the museum could not be considered “censorship” since the event was not an exhibition but a fund-raising activity. Similarly, the Turkish National Committee of the International Plastic Arts Association (UNESCO AIAP) board of directors said in a press release that the incident does not constitute “censorship” since an act can only be considered censorship if a third party such as a government, a local authority, a ministry, a municipality or the police is responsible. Voicing disappointment with the statements of the two bodies, artist Hakan Akçura released a press statement with the support of more than 90 people from the Turkish art community, declaring that they consider İstanbul Modern’s action a form of censorship and called on the museum to apologize both to Hayon and the art community as a whole. Tuesday’s panel discussion was initially organized as part of the museum’s ongoing exhibition “Dream and Reality,” a chronicle of the works of female artists from Turkey since the 1900s, during which three contemporary artists, Selda Asal, Seda Hepsev and Mürüvvet Türkyılmaz, were going to talk about their works of art in the show. In the context of the recent controversy, however, the artists announced on Monday through social networking sites that they had decided to devote the panel discussion to such issues as transparency and private and public institutions as well as artists’ rights. But discussion at the event, attended by more than 80 members of the art scene took on a life of its own after panelist Türkyılmaz announced that she would be withdrawing her work from the show in response to İstanbul Modern’s actions. The audience then raised questions and voiced concerns about an array of problems related to several forms of censorship dominating the current art world in Turkey, a lack of organization among artists and problems caused due to the fact that all major cultural institutions in the country are backed by various corporate entities and the lack of transparency in their activities. While the statements from AICA Turkey and the Turkish National Committee of UNESCO AIAP were harshly criticized, the absence of Hayon and representatives of the museum to give their account of what had happened raised considerable complaint among the panelists and the audience. Many attendees also underlined several times that İstanbul Modern should apologize to the participants and the audience of this event since it ignored the concerns of the art world in general by not being present during the panel discussion. Following the panel, seven other artists — Ceren Öyküt, Gözde İlkin, Güneş Terkol, İnci Furni, Ekin Saçlıoğlu, Neriman Polat, Leyla Gediz — and artist collective AtılKunst followed Türkyılmaz and announced that they would be requesting that the museum remove their works from the exhibition.